Everyone has seen radio buttons in online forms. You can only select one option (usually). When you select another option, the previous option that you selected becomes blank, or "pops out." The name radio button was originally used to describe this type of online form element because the select-one-option-and-the-previously-selected-option-is-deselected behaviour replicated the action of buttons on old car radios. However, even for people who do remember the enjoyable and oddly pleasing sensation of changing the station by stabbing one of those chunky buttons, the radio button moniker for those circles next to answer options in online forms usually left people shaking their heads. The problem was further compounded by the large number of people who are too young to remember those old radios. Also, think of the many parts of the world where cars were few and far between only a few years ago, especially in rural areas. 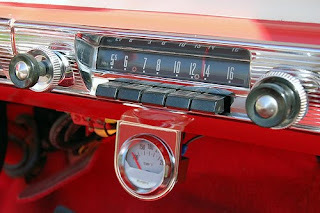 Many people in those countries never would have had a chance to see an old car radio, regardless of their age. Those same places are now experiencing huge technological growth, and will soon have, in real numbers, more computer users than anywhere else. The funny thing is, many people still have never heard the term radio button to describe internet answer options. The term does not always accompany usage of the radio button/option button in online forms. It is often only used in help files, or other documentation. In short, the term radio button confused a hell of a lot of people! Microsoft recognized this confusion, and has now started using the term option buttons. Now, the question is, do you select, click, choose, or enable an option button? The answer is...it depends! You have probably seen all four words used when reading instructions for filling in an online form. The most important point to remember is, use one word consistently in a document.